Just imagine that as you read this article, every second adult and every sixth child are suffering from excess weight at this very moment. The US, New Zealand, Mexico and Hungary are the countries with the highest obesity rates among adults, and the overweight impacts their citizen’s social status as well as the physical and mental state. So, it’s actually no wonder if you get a writing assignment on obesity where you have to research one or several aspects of this soon-to-be global issue. If you also get a task to produce an annotated bibliography for your paper, don’t worry. It’s not that difficult as it seems if you get your bearings in all the rules for completing it properly. 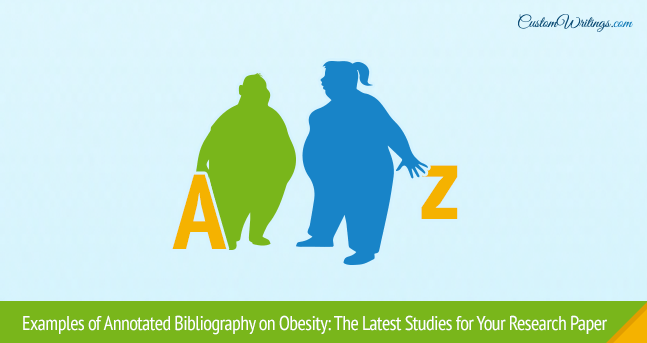 And we in our turn will give you several examples of the annotated bibliography on obesity so that you could see those regulations used in practice. Moreover, we will provide them in 2 main citation styles: MLA and APA. Enjoy! The work attempts to find a connection between obesity and diabetes of the second type. This issue has been explored, considered and debated by numerous scientists during years. The fact that this connection exists even in theory makes one reflect on his/her diet and eating habits. That’s why it’s so important to include this research in the paper as it adds weight to the words that obesity is bad for your health. The article examines two types of the weight loss one of which includes using medicine while another criticizes the doubtful “healthy” nature of the drug involvement. They both provide valuable arguments for and against medicine implementation and give great insights into the life of obese people who try to lose the excess weight. The research focuses on the numbers and statistics on obesity that lately have grown drastically. It is looking for the best treatment in such a situation which is not an easy task – e.g., weight loss medicine has been tested on adults, but children and adolescents have never participated in tests, thus can’t be treated this way. This study shows the overall complexity and gravity of the obesity situation which greatly helps to describe the current state of affairs. The study reveals the consequences of obesity for pregnant women after conducting a comprehensive research from 2009 to 2011 among more than 46 000 deliveries in Canada and France. Their findings present the connection between obesity and HDP ( a hypertensive disorder of pregnancy), macrosomia and cesarean delivery. This study helps to highlight the dangers of overweight for a particular group of women which adds value to the statements in our paper. Check out how the annotations are written. 3 for the price of one – and all you have to do is to spend 10 minutes on reading our article. You are welcome. Enjoy!